It is finally upon us. 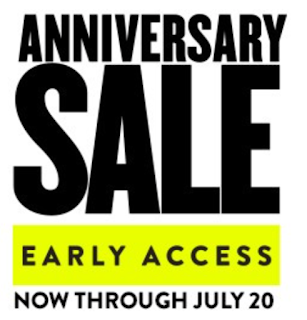 Nordstrom Anniversary Sale Early Access is live for those of you with the card! Here are my top picks right out of the gate. All you have to do is click on each item in the pictures and it will take you directly to the piece on the Nordstrom website. I will keep you posted over the next few days for additional faves. You guys, there are so many great things!! Shopping tip: Remember to pick pieces you can mix and match, choose items that will pair well together, know your closet inventory and most of all have fun!! And as I am forever grateful for all of your love and support, I am giving one lucky reader a $100 Nordstrom Gift Card to use the first day the sale opens to public. Congrats to Robin on winning the Giveaway!!! I would love to get the Small Love Nubuck Crossbody Bag REBECCA MINKOFF is beautiful! I definitely will get the Adeline Boots! I love all of your choices. I would love for them to already be in my closet!!! I would probably get a pair of booties or a pair of slides like the Corbin Slide Loafer that you picked out and I think I'd get them in wheat. Thanks so much for this chance. I would buy the Tory Burch 'Miller' Flip Flops. I would love to get one of the Halogen V-Neck Merino Wool Cardigans! I like the Halogen Side Tie Cashmere Sweater. I could really use a new bag! There are some really nice ones at great prices. I would purchase some new booties! I WOULD BUY SOME DRESSES AND SHOES. I'd get a Marc Jacobs or Kate Spade tote! I would likely purchase a pair of Hunter rain boots as I have wanted a pair for as long as I can remember. I love the Vince Camuto Fileana booties and the Patagonia quilted pullover. So many other greats things too!